I’m hosting the author of Tamed By The Fire on The 10th of January. 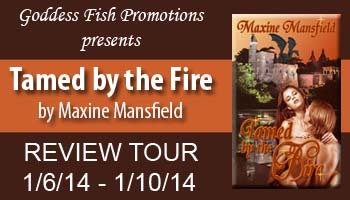 I’m thrilled to have Maxine Mansfield as my guest later in this month. It is a review tour so I’m eagerly looking forward to reading this selection. Check out these earlier stops for the tour for a chance to win prizes. Maxine will be awarding a $25 Amazon or BN GC to a randomly drawn commenter during the tour. This entry was posted in Uncategorized and tagged Maxine Mansfield, Tamed By The Fire. Bookmark the permalink.